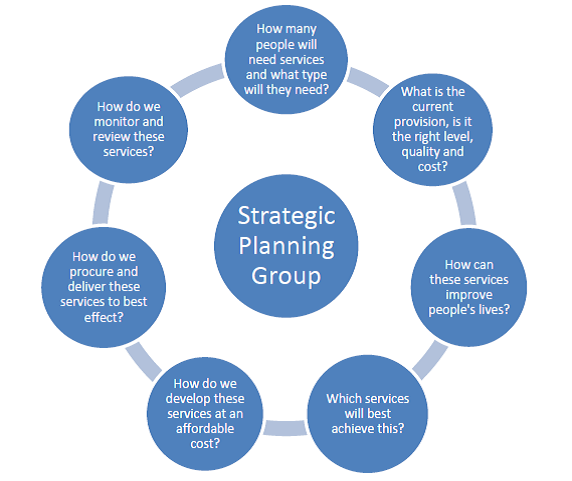 The strategic plan has been developed through a process of engagement with local communities and the people who work in health and social care. The Chief Officer of the IJB hosted a series of staff engagement events and public meetings across all of our localities and islands to describe the process of integration and to consider the priorities of staff, stakeholders and communities. It was important to engage in this way to ensure that we built the vision and priorities of the strategic plan on the ideas of people who deliver and use our services. The outcome of that engagement work is described visually overleaf – the more often a word was repeated the more prominent it becomes on the graph. The major priority of the people we spoke to was for more locally based community care that supported people to live independently at home. The legislation requires that we establish a Strategic Planning Group to oversee the development and delivery of the strategic plan. It brings together a wide range of stakeholders from the NHS, Comhairle, third sector, housing, service users, carers, as well as representatives of all of the localities.